Osteocare is Britain's favourite family of products specially formulated with calcium to help maintain normal healthy bones in men and women of all ages. All Osteocare products have been specially developed so that they can be taken with other Vitabiotics products, allowing you the freedom to continue taking your daily multivitamin whilst ensuring an additional supplement of calcium and supporting nutrients for bone health. Many people who take a bone health formula are also interested in maintaining the health of their cartilage and connective tissues. 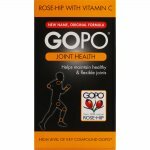 Osteocare Glucosamine has been designed so there is no need for separate products. The advanced formula provides great value by combining bone and cartilage health nutrients in one comprehensive formula. 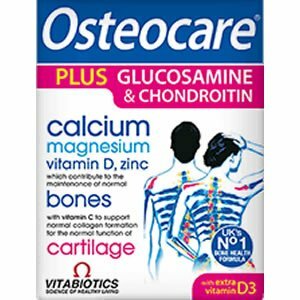 Osteocare is the UK's no.1 bone health formula and has been scientifically developed on the basis of the very latest research to provide a rich source of calcium, magnesium and zinc which contribute to the maintenance of normal bone plus vitamin D which helps with the normal absorption and utilisation of calcium by the body. Osteocare Glucosamine contains the preferred D3 form of Vitamin D. Vitamin D3, also known as cholecalciferol, is the form of vitamin D that is produced by the skin on exposure to sunlight. D3 is the preferred form of vitamin D because it is the specific form made in the human body and therefore more effective than D2 which is found in some supplements. Cartilage is the flexible connective tissue found between bones. Vitamin C contributes to normal collagen formation for the normal function of bones and cartilage. Osteocare Glucosamine also provides copper which contributes to the maintenance of normal connective tissues, plus Glucosamine, Chondroitin and Ginger Root extract. Getting enough calcium is especially important for men and women over 50, during pregnancy and breastfeeding, and during and after the menopause. For those that do not like swallowing tablets, Osteocare Fizz, Chewable or Liquid is an ideal alternative. Two to three tablets per day with your main meal. Swallow with water or a cold drink. Not to be chewed. Do not exceed the recommended intake. Osteocare Glucosamine contains glucosamine sourced from natural chitin. Do not take if you are allergic to fish or shellfish. Diabetics and those taking anti-coagulants (blood thinners) should consult their doctor before using this product. 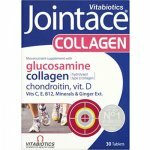 This formula replaces other Osteocare and Jointace supplements. A regular intake is recommended. As with other supplements, seek professional advice before using if you are under medical supervision, pregnant, breast-feeding, suffer from food allergies or are allergic to any of the ingredients. Calcium Carbonate (Maltodextrin), Glucosamine Sulphate (from Crustacean) (as Potassium Chloride) USP† (Polyvinylpolypyrrolidone), Magnesium Hydroxide (Pregelatinised Starch), Chondroitin Sulphate Sodium (from Fish) USP†, Bulking Agent: Maltodextrin, Cross-Linked Cellulose Gum, Tablet Coating (Hydroxypropylmethylcellulose, Microcrystalline Cellulose, Acetylated Monoglycerides, Natural Source Colours [Titanium Dioxide, Red Iron Oxide]), Anti-Caking Agents: Stearic Acid, Magnesium Stearate & Silicon Dioxide, Vitamin C (Ascorbic Acid [Carrier: Hydroxypropylmethylcellulose]), Zinc Sulphate, Vitamin D3 (Cholecalciferol [Carriers: Acacia, Sucrose, Corn Starch, Medium Chain Triglycerides, Antioxidant: DL-Alpha Tocopherol]), Ginger Root Extract (Magnesium Carbonate, Magnesium Oxide, Starch, Dextrin), Copper Sulphate, Manganese Sulphate, Sodium Selenate.